BMG’s range of industrial slurry valves, which are designed to cope efficiently in harsh mining conditions, includes robust butterfly and knife gate valves, as well as diaphragm and pinch valves. “These industrial slurry valves meet stringent quality and safety specifications and are highly efficient on the mines for the control and isolation of abrasive slurries,” says Willie Lamprecht, national product manager, BMG. “Failure of a valve and subsequent leaking of corrosive media can have devastating effects on the safety of personnel and equipment, leading to premature system failure and costly downtime. Therefore it is critical that the correct valve is selected for every application, for maximum safety, ongoing operation of the plant and minimum unscheduled maintenance. In mining operations, selection of the correct industrial slurry valve is based on factors that include the size and shape of particles, pressures, temperatures and chemical content. Polyurethane lined knife gate valves are available from BMG in standard sizes between DN 50 and DN 600, with manual, pneumatic and electric actuation. These valves have a wafer pattern and are manufactured from cast and ductile iron, with stainless steel discs. They can withstand operating temperatures of between - 20 and 80°C as standard, with higher temperatures on request. Polyurethane liner abrasion-resistant butterfly valves in a wafer pattern or with a lugged design are used for on/off and control of abrasive slurries. Butterfly valves are available from BMG in standard sizes between DN 50 and DN 400. Locally manufactured FPV diaphragm valves, between DN 50 and DN 350 with manual or pneumatic actuation, are designed for abrasive slurry applications. These flanged diaphragm valves have a body pressure of PN 10 and can withstand temperatures between -10 and 80°C. Long lasting rubber and jumbo rubber linings are suited for full-bore diaphragm valves with a high flow capacity and an efficient sealing capability, which shuts off any flow and prevents leakage. Full bore diaphragm valves also have a low pressure drop because there is almost nothing obstructing the flow when the valve is fully opened. This creates little resistance to flow, which makes these valves suitable for fluids with abrasive particles. 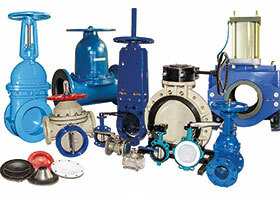 The range also includes unlined diaphragm valves suitable for water treatment and general industrial applications. FPV pinch valves, featuring a design where the sleeve is pinched to close mechanically or automatically by means of hand-wheel or actuator, are ideal for the control and isolation of abrasive slurries. Open frame pinch valves are available with a short and long frame design, in sizes between DN 50 and DN 600. The body is made from mild steel, but stainless steel is also available for specific applications. These valves, with soft rubber sleeves, have manual, hydraulic and pneumatic actuation and can withstand temperatures between -20 and 80°C. BMG’s extensive range of components for fluid technology systems and general industrial applications encompasses valves, hydraulic hoses and fittings, accumulators, cylinders, heat exchangers, pneumatics, hydraulic motors and hydraulic plumbing, as well as pumps and reservoir accessories. The company also offers a total process and lubrication management solution, to meet exact market requirements.